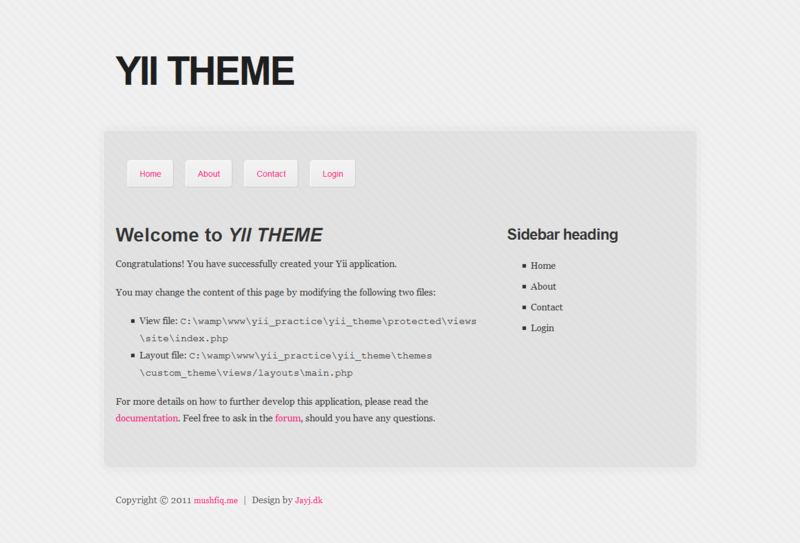 Creating a YII application theme from a HTML template. Last week I was working on a project,that was developed using YII.Client requested some new features in the existing application and asked us to change the old layout of the application.In this post I am using a HTML template to integrate in YII app. I have built a default webapp using YII command line tool.If you are not familair with YII command line basic app creation you can check my previous post on YII. 1.Choose a HTML template and keep it under the theme directory an declare it in application configuration. Step 1.For this post I have used a Open Source Free HTML5 template,you can choose you own and play with it. Here “custom_theme” is the name of the theme I am using. >>views:here we will have to create two more directory inside it=> sites and layouts.Here we will keep our files. Inside layout the main.php file should be kept and this file is inherited by all over the theme. And inside layout we can keep static and custom layouts like contact us,log in etc. Step 3.In t his step we will add php code to our html template so that it can work properly and dynamic. And the main layout is ready,as other pages are inherited from this main.php the theme is almost ready. we have to put a custom widget to have the contact us form.I have used all the default code from the app just added form inside new custom theme. You can fork into my git repo and play with it from here. N.B:My git YII_THEME app is outside the YII Framework directory,to run it you should keep the framework directory just before it. To learn more about YII theming,you can check it. Getting started MongoDB with PHP. Tq for this tutorial mushfiq! I have looking for this tutorial for some times!!! Thanks for the sample too! Its really working! Excellent post! Many thanks for sample. Thanks for the post, i am rebloging it to my blog. Thanks for a simple informative tutorial, I have one doubt , How can i link to images in the template? Reblogged this on tjhia Blog's. Thanks a lot. Very easy to understand. But I have one question… why the ‘contact.php’ was called from “custom_theme/views/site/contact.php” and not from “protected/views/site/contact.php” like the other? Thanks for this tutorial. Great ! !